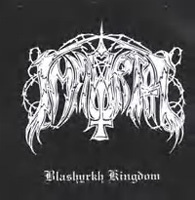 Immortal EP - 1992: Diabolical Fullmoon Mysticism (intro), Unholy Forces Of Evil, The Cold Winds Of Funeral Frost. Waldrock Festival, Beroom, Holland - July 3rd, 1999: The Sun No Longer Rises, Withstand The Fall Of Time, Solarfall, Blashyrkh (Mighty Ravendark), Unholy Forces Of Evil, Years Of Silent Sorrow, Walrock Roar. Of the big five bands in the Norwegian black metal scene (Mayhem, Darkthrone, Emperor, Immortal and Satyricon), Immortal have always distinguished themselves by not basing their musical vocabulary predominantly upon Scandinavian sources. Rather, Immortal have always sounded like a New York band given their facination with main death and black metal bands in the metropolitan area. This fact will be denied by everyone, but it's the truth. Blashyrkh Kingdom is the first release on the Cult Of Evil Gods label and it collects two very rare early releases and a soundboard recording from their appearance at the Waldrock Festival two years before they broke up in 2002. The quality of the demo is dull, primitive and raw, as is to be expected on such a tight budget. Immortal at this time were playing straight ahead death metal with blast beats, very low vocals and down tuned guitars. The first song, "Suffocation Of The Masses" is the big clue as to their influence because they sound almost identical to Long Island's Suffocation. The emphasis is upon brutal sounding music with lyrics that don't really make sense. It is competent, but not is not the direction where the band would eventually go. That is obvious on the second part of this release, the very rare 1992 Immortal EP. They sound very influenced by New Yorker Paul Ledney and his Profanantica/Havohej projects. Finally the complete excellent sounding soundboard tape from their appearance in Holland is included. This has been released before on Waldrock '99 in similar quality and is an essential live document. Immortal were one of the first bands to prove that black metal could be played effectively live. "Unholy Forces Of Evil" contains a minute-long groove by the rhythm section to allow Abbath to do his fire breathing routine. The only problem with this part of the disc are the gaps between each of the tracks, as if it weren't copied with DAO. It's a bit annoying. But that aside this is a great release limited to three hundred copies. It's also floating around, as are all the releases on this label, in the LP format because we all know that vinyl is categorically more evil than CD. It's common knowledge that Hell still use turntables, many of which run backwards.